Well happy Monday my friends! I hope everyone is feeling Marvelous! So, guess what? I've actually been in the kitchen lately! I know, shocking! I have been so bad about getting in there and spending time preparing full meals using different ingredients. In my defense, I was dealing with quite a few things, including you know, family stress a few weeks ago, completing my yoga teacher training for my continuing education credits for my training certifications, as well as updating my CPR/AED certification and well…you know, work and family. Busy! Now though, I'm cooking! Have you guys heard about the Grains Of Discovery from Bob's Red Mill? I'm loving going through the adventure of discovering ancient (gluten free) grains through this line they have. For now though…let's talk SORGHUM! Have you tried it? This was my first time trying it and we all loved it! I get nervous cooking different stuff for the guys, but they all loved sorghum. It takes awhile to cook, but it's so worth it. If you haven't heard of it, sorghum is an ancient cereal grain high in antioxidants and is believed to lower the risk of cancer, diabetes, heart disease and neurological diseases. It has a very mild taste. For me, it was reminiscent of small grain brown rice. It's also fun because you can pop it like popcorn! How fun is tiny popcorn…so fun and delicious! I cooked a large batch to have on hand all week. I'm trying to get better about having things prepped and on hand for fast additions to complete meals. This worked so well for our vegetable soup! The soup was a "clean out the freezer/fridge soup" and the sorghum was exactly what I needed to add extra protein and whole grains to the quick soup. The texture is great too since it's firm and slightly chewy. Sorghum gave a nice contrast to the soft vegetables in the soup. It would also make an incredible addition to salads! 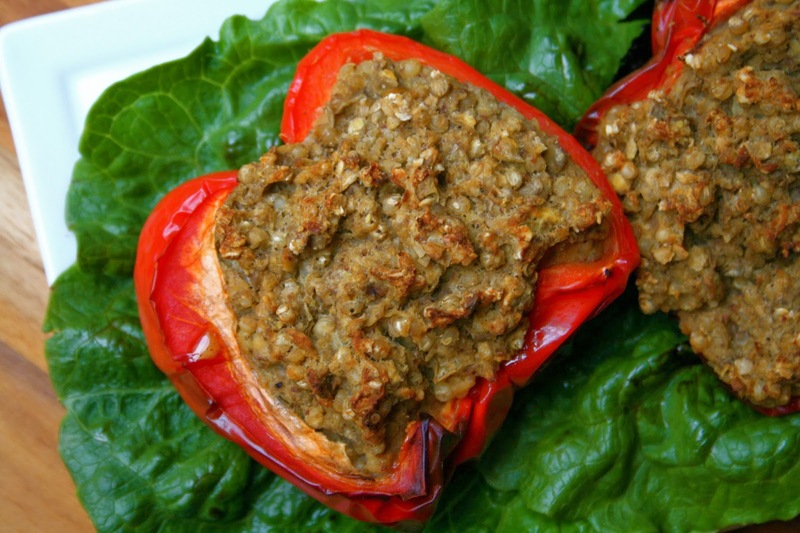 As soon as I tasted sorghum, I knew right away that it would be perfect with lentils for burgers and stuffed peppers (which I have been craving forever!). These were so good! 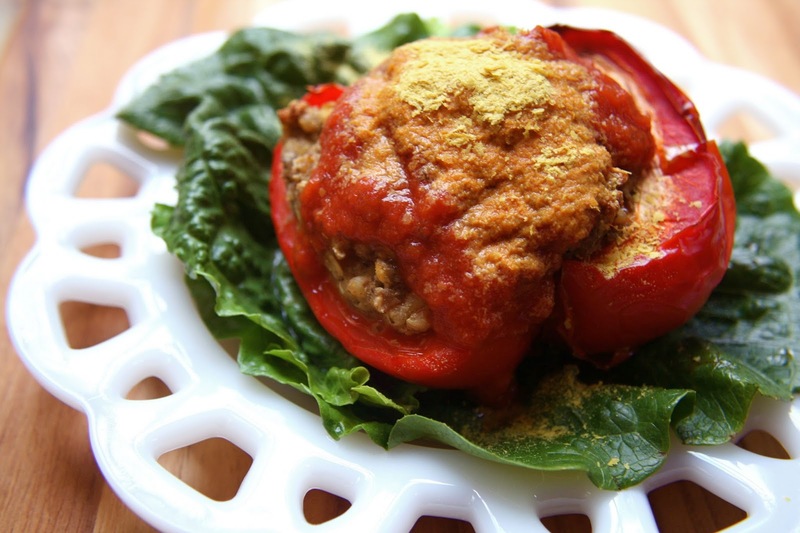 The perfect texture on the inside with a mix of slightly crispy on the top, chewy and dense on the inside with a sweet roasted pepper on the bottom. I LOVED this mixture. I also made burgers with it to keep in the freezer for later. I actually made 2 peppers cut in half and 23 burgers with the remaining filling. This mixture freezes beautifully too which is a huge bonus for me. Cook the sorghum and lentils according to package directions. Drain excess liquid from them. While the steamed cauliflower is still hot, puree in food processor and then place in a large mixing bowl. Mix in the flax meal and set aside while you process 1/2 the lentils in the food processor. Next, add the sorghum, lentils, oats, onion powder, garlic powder, salt and pepper to the cauliflower mixtures. Stir well to combine. 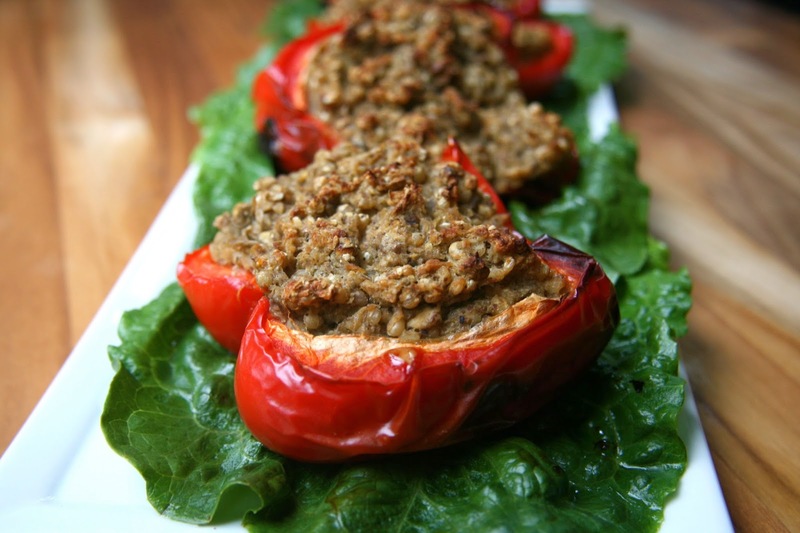 *For the stuffed peppers, slice red peppers in half from top to bottom. Clean out the seeds. Lay the peppers on their sides in a greased baking dish. Fill each half with about 3/4 cup sorghum mixture. Bake at 400 degrees for 45 minutes to an hour or until the top of the peppers is browned and the peppers are soft. *For burgers, form mixture into burgers using about 1/2 cup of the sorghum mixture. Bake on a parchment lined pan on 400 degrees for 20 minutes, flip the burgers and then bake an additional 20 to 30 minutes or until the burgers are slightly browned. I topped my peppers with pasta sauce and nutritional yeast. You know, because it's so good! 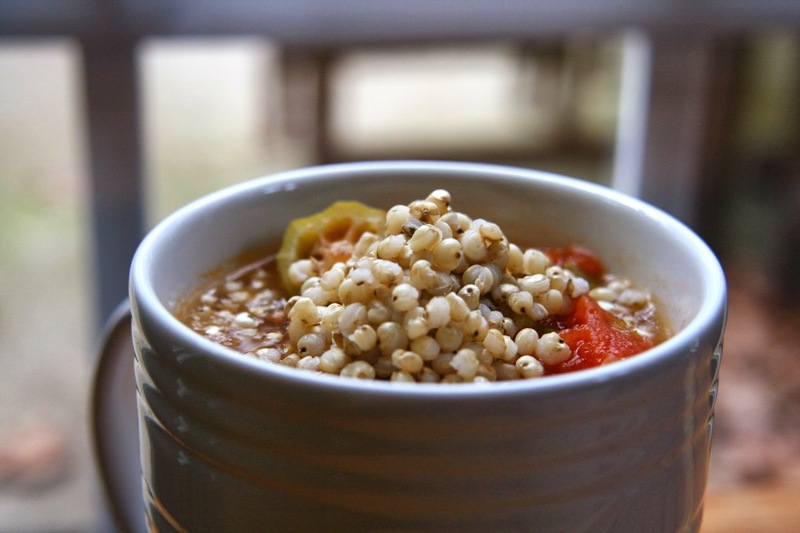 Have you tried sorghum? If so, what have you done with it? I'm sharing this on Allergy Free Wednesday. i've only tried the flour. Oh woman, i am so missing out! must get! You are going to expand my horizons my friend - I need to try this! I adore lentils, as you know :) YUM! Glda you had as relaxing a weekend as you could - let's dream of lakations together! 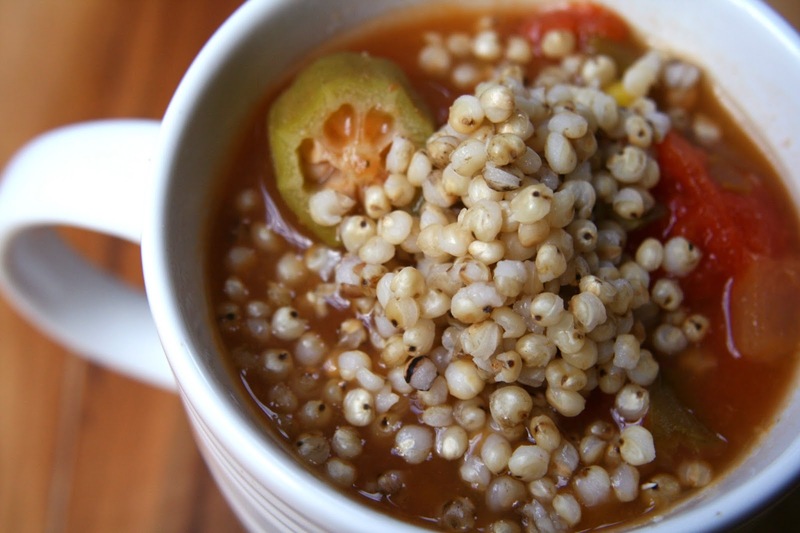 I've only tried sorghum beer - probably doesn't count huh ;-) this recipe sounds so good. Love topping with the sauce and nooch!! 23 burgers. Damn woman; that is some efficient work right there. I am super impressed. It doesn't hurt these sound absolutely delicious as well. 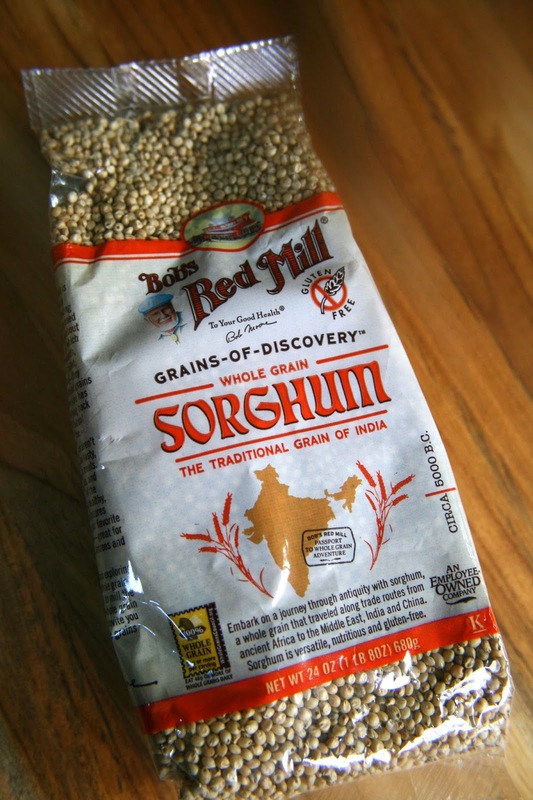 I've never had sorghum before, but now I can't wait to try it. Thanks for the recipe. Amazing Weekend With Friends and Family! Squ-hash Browns With Savory Waffles!